I sort of dread it every year. While I believe in celebrating holidays, I don’t really like the commercialization of most of them. For me, it’s not about “He went to Jarrod!” (Like jewelry purchased from any other place is less than meaningful.) It’s about time spent together in a meaningful way. DSH hates the little blue pill commercials where the guy is off sailing by himself, or spending time alone on a motorcycle, or driving alone in a sports car. What is the point of the little blue pill if you aren’t spending time with a loved one? I hate the drug commercial where the mother is shopping with her daughter for a wedding dress. The mother has to use the bathroom and the daughter is utterly disappointed. The mother feels guilty. Because she has to use the restroom. The final insult is the daughter shares her personal moment with the sales lady. Who apparently never has to go to the bathroom. What kind of child would show so much disappointment, rather than concern, for her mother’s need to use the restroom? I actually sent an email to this drug company complaining about that commercial. It completely disparages the mother and child relationship over an issue for which everyone should be concerned and empathetic about. Mothers get enough blame and have enough guilt without marketing idiots adding to it. I was married once before I was married to DSH. It was a short marriage, and I was very young. I used to receive flowers from him. Getting flowers is nice, but not as a substitute for not being present in your loved one’s life. I received a lot of flowers from him, because he was never there for me, physically or emotionally. The flowers were supposed to compensate for his lack of ability to be there. After I shared this story with DSH, he never gave me flowers again. Did I say I did not like getting flowers? No. I just do not want flowers, or any gift, to be a substitute for being present and engaged in a relationship. So, this weekend is Mother’s Day and DSH’s birthday. We will be going to our Little Cottage by the Lake along with my sister, her three little dogs, my mother-in-law, and one of the college kids. We hope to have nice dinners with them and some other relatives that live near there to celebrate both events. I am looking forward to this and know we will have a great time. Apparently, I am not the only one who feels this way. Yeah, kind of like what the kids needed (and got) when they were growing up, and we promised each other we would do for each other once they were grown. For me, it’s not about the things. I love anything my family does for me, but what I would love more than anything is some time and attention. Without computers and phones. Without having to cook and clean. No one has ever been able to accuse me of being subtle. I think I have been pretty direct. I haven’t beaten around the bush or dropped a series of hints. I have expressed myself explicitly and directly. I’m thinking maybe we could plan it for Father’s Day. Postscript – I hope that all of the mothers out there have a wonderful day spending time with the people they love or doing whatever they want to do. Happy Mother’s Day! I am glad you were honest about wanting undivided attention – I think now when we’re all so ‘plugged in’ it’s almost impossible to achieve that. I think it stinks that you can’t get it the day you want it – isn’t that part of the gift aspect? Sometimes you want what you want WHEN you want it without being expected to compromise. Sheesh. I may ask for a cell-phone free day myself this holiday. Sometimes I look at my husband on his phone checking work emails at dinner, outside with the kids, anytime really and think of ways to destroy that stupid phone. Then I turn around and realize i have checked FB 800 times that day doing the same thing. Yes, definitely asking for a cell phone free day this Mothers Day! Happy Mother’s Day to one of my favorites! I love being connected, too, but my feeling is if he can spend some undivided time talking to the kids, his mom, and his friend (conversations that last more than a few minutes) then he should be able to find time to do that with me, too. And it shouldn’t be late at night when we’re both exhausted. We should be able to have it in prime time. It seems that we short change the people with whom we are closest and, yes, I know this works both ways. Will be spending Mother’s Day at Emily’s house with my whole family and mom. My kids and nieces and nephews will handle everything. It will be great. I know you will have a great day. Happy Mother’s Day! I loved everything you said but I was awed by your disgust of the commercial with the bride and her mother. I have had the same thought everytime I see it and I always wondered if anyone else would be as disgusted by the brides behaviour as anyone else (obviously written by a man since every bride I know would wait for their mom with concern over a medical condition). Thank you. You made my day. I have never heard from the drug company after my email to them about that commercial, but I also haven’t seen the commercial in awhile either. Maybe they thought better of the message they were sending by airing it or maybe it just ran its course, and whoever wrote and approved it for use just wasn’t using common sense. I, for one, will never use that drug because of that commercial. Anyway, I do love Mother’s Day, but I get so upset about the messaging we send around any holiday. They should not be about the things, but they should be about the celebration together with loved ones. Hi Theresa, I’m late catching up with this. I get what you mean, but for me the letdown revolves around missing my kids and craving their attention. For me, Mother’s Day has become a day of introspection and mixed feelings. Growing up, it was the day my mother’s extended family all came to be with Grandma, who lived with us–so it was a day I remember with great celebration altho the women were probably working all day to make it happen I now realize! In 1992, my father died on MDAy after we spent a perfect, wonderful day with him and my Mom and (a rarity at the time) my very well-behaved, cheerful early-teen daughters on Catalina. So, that was actually a really good memory–a perfect Mother’s Day in its paradoxical way. My father instilled a lifelong habit in us–I wouldn’t have ever missed sending the most beautiful card I could find to my mother, but for whatever reason I don’t get them often and I find myself “expecting” them, which is a setup for disappointment I realize. I.divorced my children’s Dad in 1991, moving out on Mother’s Day the year before my Dad died, The bitterness that followed the divorce didn’t help my children think of it as a great day I’m sure. I think fathers have to teach their children how to honor their mothers and of course that wasn’t in the cards for mine (pun intended)! Somehow text messages don’t feel the same, but I do appreciate the phone calls that usually make it. The combination of missing my parents, the contrast of how wonderfully my permanent husband treats me to the distracted, busy-ness of my children who are seldom around on any holidays, often leaves me a little forlorn (i.e. self-pitying). I’m going to try to figure out how to re-channel my emotional energy on holidays so that I don’t become depressed on them, like I remember my Dad was so often. Thank you for sharing so honestly and stimulating my own “meditation.” Happy belated Mother’s Day! What a wonderful, bittersweet day it is for you. 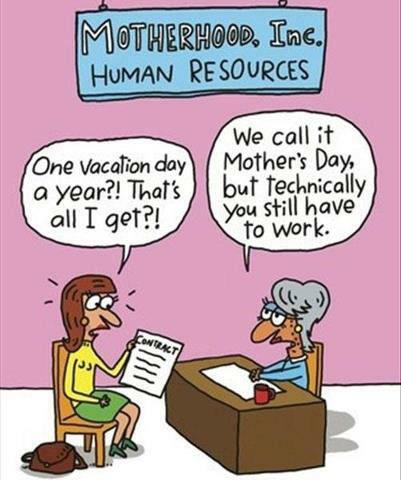 My emotions are mixed between it just being a “Hallmark” holiday and the need / desire for a special day to be recognized for all we do as mothers. I wish that I could feel about my own mother like you do about yours. Unfortunately, she abandoned me in 1991 as she was so lost in her constant desire to bring harm to my father, her ex-husband, that she was willing to sacrifice her own grandchildren (my two children at the time) and my family. If you were one of her children who “screwed up” you were loved, but if you were like me and always did and tried to do the right thing, you were villified. I am blessed to have five wonderful daughters who both love and care for one another and also love and care for us as their parents. We worked hard to make this so as I was intent on not repeating the past. Yes, it is a constant with me, too, to channel my emotional energy at all of the holidays to be positive rather than sad as so many of them were when I was a child. I believe that our children’s memories will be much different than mine, and for that I feel happy and successful in breaking the cycle.